Going out to dinner, playing in the fields or just lounging about the house, these are the pants to be wearing. These unisex pants are designed for cozy stretch knit for comfort but they don't lack in style. 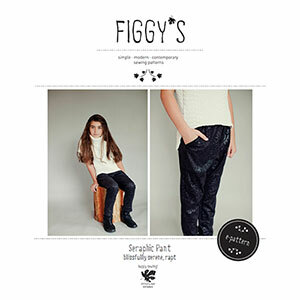 This modern pant includes front/back topstitched seams, pockets, faux fly and waistband. A slight drop in the center seam gives the pants a touch of contemporary without dragging down the look. Pair these pants with the Celestial Pullover for the perfect cozy ensemble. Pattern size range is 18 months through 9 years. 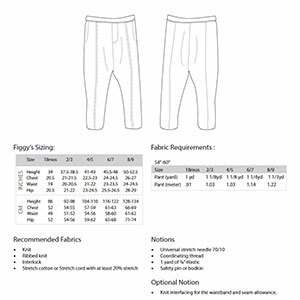 Recommended fabrics are mid weight cotton jersey and cotton spandex, ribbed knit, interlock or any knit with at least 20% stretch.